Capital Cost– This consists of initial expense of building SOC and includes everything from furniture to hardware, software and external consulting fees. Annual Payroll Cost– This includes salary and benefits for people running the SOC. Depending upon location and the size and scope of SOC, this can vary significantly. However, this is a major part of annual cost. Annual Recurring Costs– These costs include annual licensing fees, equipment depreciation, skills training, threat intelligence feeds, and general IT cost. While estimating these costs, think about major cost buckets and get cost estimates from multiple vendors. For example, you may want to consider cost from multiple SIEM vendors by providing them high level requirements. Similarly, you can estimate number of IP addresses for subscription to network vulnerability scanning and application vulnerability assessment. The estimate for number of people may vary significantly depending upon whether you want to run a 24x7x365 SOC or something less than that. Following is one way of estimating number of people for 24x7x365 SOC. Consider three shifts of 8 hours each. Also, consider 3 analysts in first shift and 2 analysts for each of the other two shifts. This will make 7 analysts on daily basis with 8 hours each, resulting in a total 56 hours every day. For the whole year (365 days), this will require 20,440 hours. Let us make it an even number of 20,000. Typically, one person will work for 2000 hours on annual basis, at the most. This means you need 10 analysts to run the SOC. You can divide these analysts into Tier 1, Tier 2 and Tier3. In my example, I estimate 5 tier 1 analysts, 3 tier2 analysts and 2 tier 1 analysts. In addition to analysts, you will also need specialists like forensics and malware experts and a SOC manager. If the SOC is not 24×7, your estimates will change accordingly. Based upon number of shifts, you have to create a schedule for these analysts and plan for vacation, training, and other situations. Typically, SOC manager will perform these duties. We will have a separate blog posts about roles and responsibilities of each person and scheduling. As for as technology cost is concerned, you can explore options for Software as a Service (SaaS), purchasing perpetual licenses, or licenses with an annual cost. Vendors provide a number of options. You should keep about 20% of the software cost as annual maintenance fee but vendors can give you these numbers. For initial SOC implementation, you will need external professional services. Vendors with expertise in building and running SOC can provide initial installation and tuning help to get the SOC up and running. For a comparison, you should also consider option for outsourcing the SOC. There are many vendors who provide “SOC as a Service” and bring their expertise to your benefit. Some vendors can co-manage SOC with your team, reducing the overall cost. You should explore all options as SOC is a major undertaking and needs significant planning. Logs provide a wealth of information and that is one of the reasons that almost all security standards and frameworks (NIST, ISO, PCI, and others) emphasize on collection, storage, and analysis of log data as one of the key aspects of any security program. Collecting and managing logs is a fundamental requirement of any SOC implementation and is needed to meet many compliance needs. 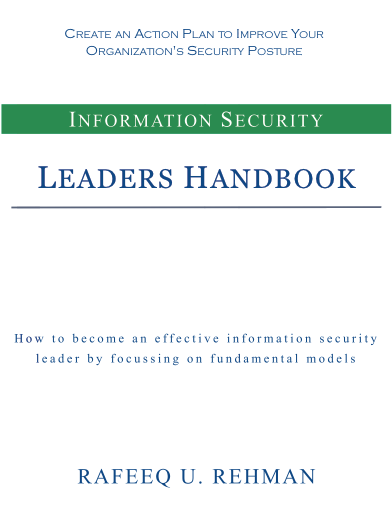 However, as we know, some log sources provide much more value to security programs compared to others. So while you can collect, store and process all data you want, thinking about the true value can help you create a more cost-effective and focused strategy. A phased approach for log management is always prudent where you start with important, more valuable log sources first and then add additional log data as your program matures. While traditional log collection using Syslog protocols and log files has worked for quite some time, newer technologies are bringing challenges to log collection using older methods. With fast transition to Cloud based technologies, newer log data may come from SaaS applications, Cloud application platform, server-less applications, IoT devices, operational technologies, connected vehicles, drones, smart city technologies, and many others. These new log sources don’t always send logs with Syslog and may utilize APIs, web services, or Cloud services specially built for logging. While planning for collecting log data and building a log collection platform, all of these new options must be considered. A distributed log collection architecture where local log collectors receive logs from different log sources and then forward to one or more central locations is commonly used today. This architecture helps in providing resiliency and reduction of loss of data in case communication link to central log collection becomes unavailable. The following diagram shows one such arrangement. Welcome to brave new world of log collection using many methods to collect logs from Cloud, IoT, Vehicles, Drones, Operations Technologies, and others. Standing up a Syslog server is no longer sufficient. A more distributed architecture can both collect as well as indexlog data locally and then make the indexes available to search requests from SOC analysts. This may be necessary to meet certain privacy needs like GDPR. However, one need to consider of the flexibility and scalability of distributed log collection infrastructure with the cost of managing it. As an example, indexing logs close to edge is attractive but it can create additional overhead in terms of correlation, reporting, alerting as well as cost of managing indexes at multiple locations. Needless to say that like everything else in life, there are some compromises to be made here as well! A timestamp is an essential part of each log event. An important factor in building logging infrastructure is to ensure time synchronizing among all log sources to keep proper order of logs. Network Time Protocol (NTP) is commonly used for purpose. While NTP is a topic in itself, it is sufficient to at this point to understand that no logging infrastructure is complete until NTP is implemented to support it. Without it, log correlation and analytics will not work properly. Lastly, building logging standards to identify type, amount, and level of logging also goes a long way to build a consistent approach throughout an organization. A logging standard must address requirements for logging at different levels including system, middleware, and applications. The logging standards should also specify accepted logging protocols, storages and lifecycle of log data. Logging standards must be updated at least on annual basis to ensure new sources and types of important logs are taken into consideration based upon their value. By taking into account the above factors, there is a much better probability that you will be able to build a better logging infrastructure that grows with your needs, reduces cost, is more efficient and resilient, and brings more value towards managing risk. Bring expert volunteer trainers with expertise in these areas, who has a passion for sharing their knowledge. With these objectives in mind, Cybersecurity Learning Saturday will become a learning event where professionals can pick a topic of their interest and join a day-long training session to upgrade their knowledge and skills. The proposed topics include but not limited to security certifications, Cloud security, security of DevOps, SOC, different types of security assessments including network and application security, and secure coding for web application developers. The first Cybersecurity Learning Saturday will be held on March 2nd, 2019 in Columbus OH. I hope to see you in this event! Registration will start soon. P.S. If you have passion for sharing your expertise and be a trainer for one of these sessions, don’t hesitate to contact me! While doing research on my upcoming book about running a successful Security Operations Center (SOC), I have interviewed people who have built and run SOC as well as survey reports from organizations like SANS and others. Overall it is a sorrow state of affairs where almost half of the organizations have no metrics for measuring the success of SOC implementations. The ones who have a metric, are mostly using non-business focused measurements to gauge performance of the SOC. Some are using metrics just to justify a particular technology investment. Most of the people are not focusing on automation (doing manual work). There is a lot of work that needs to be done to make a SOC efficient and real metrics to demonstrate business value! Data-driven business innovation is not something of distant future anymore. It is a reality of today. Many businesses are already reaping benefits of monetizing internal data that they already possess. Some are taking data-driven business innovation to the next levels by mashing up internal data with public data sources like social media feeds, weather data, and real time traffic information. Whereas others are working on generating new data from sources which were not possible in the past. For example, sensors and affordable wireless data communications is enabling gathering data from vehicles, agriculture, manufacturing, equipment utilization, and other. So what is fueling this revolution and why now? Following are few main reasons why this is happening and why you should give it a serious consideration. Cost of Storing Data – Cost of storing enormous amounts of data has decreased to a level where it is almost insignificant. Quite contrary to the old days when capital investment was needed to build storage infrastructure, now almost unlimited and on-demand data storage is available from many Cloud services providers. Availability of Analytics Tools – Data analytics tools, both commercial and in the open source, are available to process very large amounts of data at extremely low cost. Hadoop based technologies, Cloud services, and Machine Learning are fueling development of new tools. Use of Unstructured Data – Older technologies for data storage and analytics were mostly based upon structured data. However, machine learning and AI advancements have made it possible to use unstructured data for business purposes. Now it is possible to monetize notes from customer service representatives, IVR, and unstructured public data sources. Visualization – Data visualization is key to effective data-driven decision making. Now these tools are available as a service, enabling creating powerful visualizations and dashboards very quickly and without purchasing expensive tools. Wireless Communications – Very affordable wireless data communication is enabling collecting data from mobile sources and remote locations that was not possible just few years back. How businesses can monetize vast amounts to data and create data-driven strategy for business innovation? The answer is a little different depending upon type of business and the industry segment. Following are some of the ideas that you can think about as a starting point. Customer Insights – A better understanding of customers and getting insights into customer behavior is every business’ dream. Data is enabling businesses gain customer insights for better customer services and building innovative brands. This is especially interesting for B2C interactions in financial, insurance, retail and other industries. Product Improvement – Many manufacturers are using data to improve products, identify product defects, understand how products are being used, and in many other ways. New Business Models – Many companies are using data to create new revenue streams at different levels. Some companies are simply getting into the business of selling data while others are offering data analytics as a service. Equipment manufacturers are working on providing proactive maintenance in addition to machinery, all with the help of data gathered through different sensors. New Levels of Efficiency and Process Improvement – Data is fueling gaining new levels of efficiency in business processes, manufacturing processes, and even in service industries. The bottom line is that it is imperative for every business to understand the data assets they possess, understand the data value chain, and initiate a data-driven business transformation strategy. While Ransomware may be the talk of the town these days, many other profound changes are happening in the industry that impact job of information security professionals. 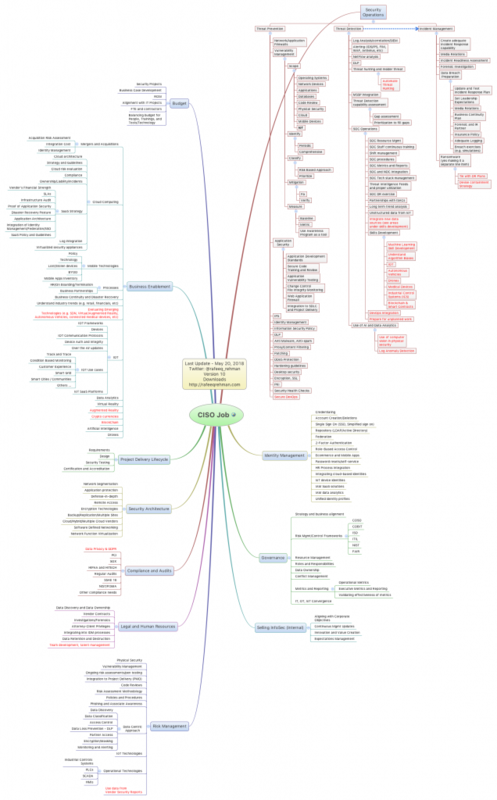 Keeping in view these change, I felt a need for updating CISO MindMap. The new and updated CISO MindMap 2017 is attached below. This time, I have highlighted all changes in red color to make it easy for those who have been following this CISO MindMap for some time. One major change is about IoT, keeping in view that more and more companies see value and are adopting IoT technologies. Lines between IoT, Industrial IoT, and industrial control systems are blurring gradually. Security professionals are being called in to respond to IoT incidents, which are increasing over time. The IoT vendors are in infancy from security perspective in many cases, with lax security controls. I feel there is a need for all organizations to include IoT as an essential part of their overall security operations. With a little research inside their organization, they may be surprised how many IoT technologies are already being used by their businesses that they may not be aware of. I also believe that InfoSec professionals should make subjects such as artificial intelligence, drones, sharing economy, and data analytics as part of their learning goals. InfoSec is an essential enabler for modern businesses and we, as a community, should be at the forefront of this progress instead of standing in the way. Last but not the least, InfoSec professionals must keep a better “Customer Experience” as a guiding principle of everything they do. I would recommend taking a short course on “design thinking” methodology that would make people think and act differently and more productively. We must improve our brand! Like always, feel free to provide your feedback and comments. Also, register on this blog to keep updated. 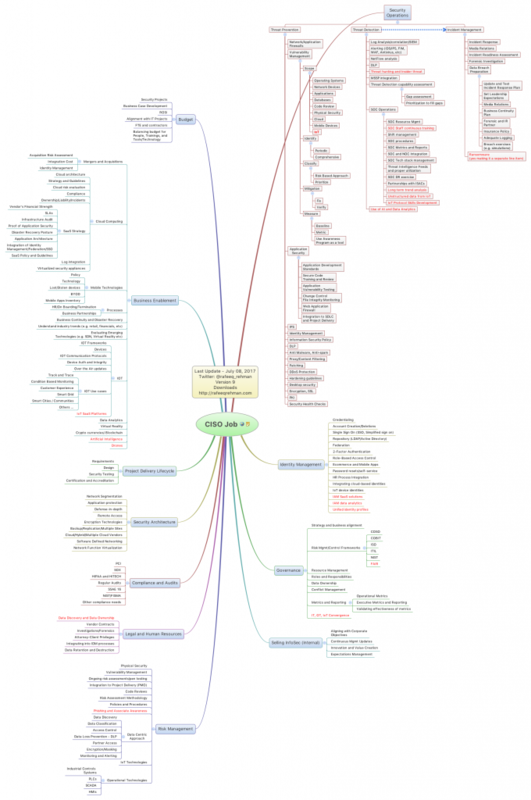 You can also download PDF version of the CISO MindMap.